So here’s another image from the fabled ‘night of the forgotten camera’ – I turned around, and shot Kevin’s tent as he sat inside and read – well, he told me he was reading, but I never saw a book, just the headlamp – I’m not sure he wasn’t just turning on the lamp to make us think he was reading. The mountain in the background is Mt Drum, this was one of the few opportunities we got to see it, as clouds covered the sky most of the time. Prtty sweet view out a tent though, eh? This entry was posted in Adventures, Alaska, Backpacking and Hiking, Landscapes, People, Travel, Wrangell - St. Elias National Park on August 15, 2008 by Carl D.
Of course this is a fabulous view from a tent! I guess the part I love about this relatively “untouched” wilderness is the direct contact with nature and getting to enjoy these splendid displays of Mother Nature and not the typical tourist type of setting where you are locked up in some silly high rise on the 162nd floor!!! Great shot Carl! 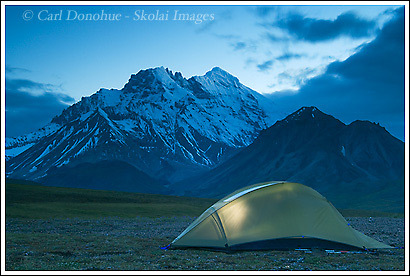 Thanks – yes, it’s definitely a treat to look out a tent window and see a sight as cool as Mt. Drum, Wrangell – St. Elias National Park, Alaska.